Tracealyzer gives an unprecedented insight into the run-time world of Linux systems. Solve software problems in a fraction of the time otherwise needed, develop more robust designs and find new ways to improve your software’s performance. Multi-threaded software often has a complex behavior, where small changes in software timing may lead to unexpected behaviors. Timing-related problems are expensive as they manifest in late stages of testing, or worse, in deployed production code, and can be hard to reproduce. This risk is mitigated if the developers have a good insight into the software’s runtime behavior. 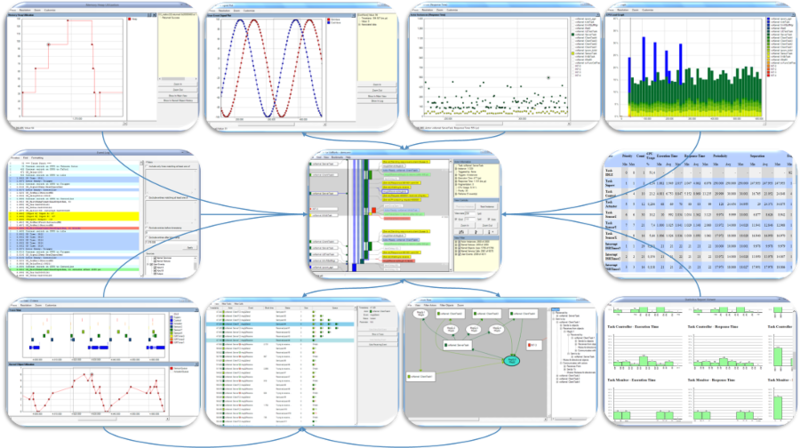 Tracealyzer for Linux visualizes the run-time behavior of your embedded software through 25+ graphical views that show the “big picture”. You may have used a tracing tool before, but the Tracealyzer visualization is on a new level. The views are interconnected in innovative ways and are very simple and intuitive to use, which makes Tracealyzer a very powerful analysis tool. Tracealyzer for Linux leverages the LTTng tracing framework and supports both kernel and user-space tracing (UST). LTTng supports Linux kernels versions from v2.6.32 and forwards, and from v2.6.38 it does not require any kernel patches. This is a pure software solution, so no extra hardware is needed to use Tracealyzer. The LTTng user-space tracer allows you to insert tracepoints anywhere in your application and you can even instrument standard library calls without modifying the library source code. Tracealyzer for Linux allows you to configure how each tracepoint should be interpreted, as a service call or general user event, parameters, formatting, etc. This is further described in the User Manual. Tracealyzer can be used as a lab tool but also for post-mortem analysis. Some customers keep the recording active in their release build, which gives them very valuable trace diagnostics on real-world issues that otherwise would have been hard to analyze. The trace recorder LTTng can be configured as a “flight recorder”, keeping the latest event history in a RAM ring-buffer, or to continuously store the trace to the device file system, or to stream it directly to the development computer. The best way to experience Tracealyzer is to download it and try the visualizations yourself. It is easy to get started and you get a free evaluation period, as well as a pre-recorded demo trace for a quick start. For licensing options and pricing, please contact sales@percepio.com If you have technical questions, don’t hesitate to contact support@percepio.com.